On Wednesday, November 14th, artist Morgan Everhart partnered with The Jacky Teplitzky Team at Douglas Elliman to host a private viewing reception for her new exhibition, “See in Real Time.” The intimate evening event took place 41 floors above the heart of Midtown Manhattan at 135 West 52nd Street, PH5, a $13.25M duplex penthouse that is currently on the market with Teplitzky’s team. Guests were treated to light bites from Green Pear Catering as they took in the artwork and city views. Skillfully balancing on the edges of abstraction and traditional still-life, Morgan Everhart’s See in Real Time is an introspective exhibition that seeks to cultivate feelings and memories of people, places, and experiences through painting. By pushing and pulling multiple vantage points and perspectives in each painting, the layers applied become intimate environments. These interacting surfaces provide the stage on which Everhart explores the passage of time, memory, and internal reflection. 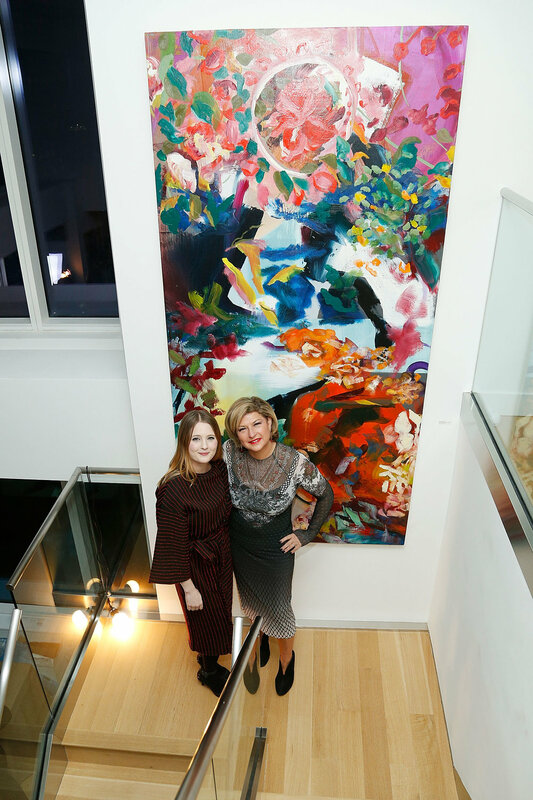 Notable attendees included Morgan Everhart and her curator Yassana Croizat-Glazer, Jacky Teplitzky, Julio Izquierdo, Adrian Radomski, Hannah Roesler and Maritza Kreutzerova of The Jacky Teplitzky Team at Douglas Elliman, Joshua Glazer of Christie’s, Sarah Szeliga of The Metropolitan Museum of Art , Behzad Jamshidi of Moosh NYC, Brian Mommsen of Mommsen Global, Emma Behringer of Modern Luxury, Nargis Foley of Swarovski, Pablo Olguin and Michelle Wong of One Kings Lane, Christel Chaunsumlit of Bryant Consulting Group and John Dixon of John Dixon & Associates.